Shopping Mall - Georgia, USA > Provectus Environmental Products, Inc. Constituents of Interest: Tetrachloroethylene, Trichloroethylene, 1,4-Dichlorobenzene, and Vinyl Chloride. 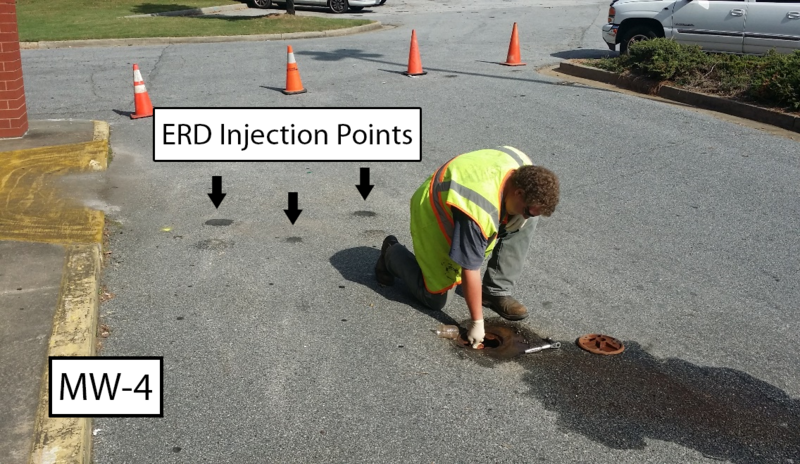 In August 2014, ERD-CH4 was added proximal to existing monitoring well MW-207s to treat groundwater at an active shopping mall in Georgia, USA that was impacted by PCE and its catabolites (TCE, DCE and VC) from a former dry cleaning operation. At the same time, the same amount of a standard ERD amendment (no methane inhibitors) was added proximal to existing monitoring well MW-4 which was located ca. 200 feet cross gradient. 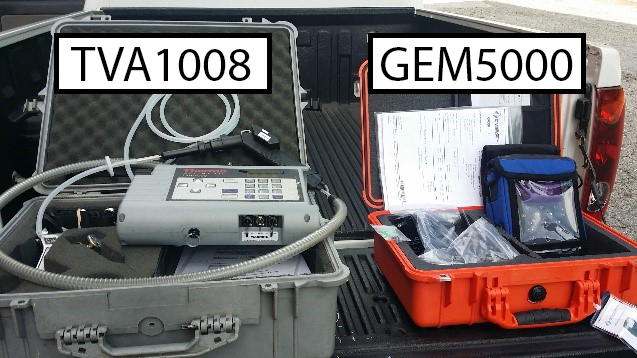 Prior to amendment application, baseline groundwater analysis were conducted for dissolved methane and COIs. Six weeks post application, groundwater samples were collected for similar analysis. At that same time, analysis of the head space gases in MW-4 and MW-207s was conducted by Field Environmental Instruments (Pittsburgh, PA) using both a Thermo/Foxboro TVA-1000B PID/FID Analyzer (PID sensitive to 2,000 ppm CH4; FID sensitive to 50,000 ppm CH4) and a LandTec GEM5000 Landfill Gas (LFG) Meter (infrared detector calibrated to 15% methane). Well head space gases were analyzed from top of the well heads immediately upon opening the well caps with readings recorded every minute for 5 minutes. As summarized in Table 2, the MW-4 (water depth 11.9 ft bgs; pressure 0.11 in) treated with an ERD substrate only had over 30% CH4 in the headspace gas as measured by the GEM5000 LFG meter (note – TVA detectors exceeded their level of sensitivity and shut down). By comparison, the well headspace gas in MW-207s (water depth 18 ft bgs; pressure 0.24 in) had only 0.5% CH4. Table 2a. Well Head Gas Analysis at a Former Dry Cleaner Site in Georgia (6 weeks post ERD application). Table 2b. Dissolved Gas Analysis at a Former Dry Cleaner Site in Georgia (Method RSK 175).